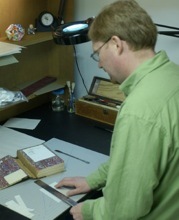 Eric Alstrom, book artist, binder and conservator, of Okemos, Michigan, has been involved in the book arts since 1989. Eric received his initial training as a conservator and binder in Ann Arbor, Michigan. While in Ann Arbor, he worked at the Bentley Historical Library at the University of Michigan as an assistant conservator under James Craven, while learning how to conserve a variety of historical bindings. He also at the Bessenberg Bindery, heading their book repair department as well as helping in the production of small editions and one-of-a-kind books. Between 1994 and 2004, Eric lived and worked first in Athens, Ohio at Ohio University and then in Hanover, New Hampshire at Dartmouth College. At both institutions, he headed the conservation lab, working on both the circulating general collections and the special holdings of rare books and manuscripts. Other highlights included designing state-of-the-art conservation labs at both OU and Dartmouth, developing several new binding techniques for pamphlet materials and softcover volumes, and teaching bookbinding for the Book Arts Workshop at Dartmouth College. In April, 2004, Eric moved back to Michigan to head the conservation lab at Michigan State University in East Lansing. He is in the process, once again, of designing yet another conservation lab, something he now considers one of his specialties. Eric also teaches workshops at Hollander's in Ann Arbor as well as at other venues. He continues to create design bindings and artists books, although raising his family has rightly taken priority. He has exhibited books both across the United States as well as in Italy and France. Eric appreciates all comments and will answer all questions. Please email him at bookworks@webalstrom.ftml.net.